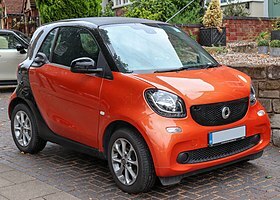 The Smart Fortwo (stylized as "smart fortwo") is a rear-engine, rear-wheel-drive, 2-seater hatchback city car manufactured and marketed by the Smart division of Daimler AG, introduced in 1998, now in its third generation. Marketed in 46 countries worldwide, Fortwo production had surpassed 1.7 million by early 2015. The brand name Smart derives from its early history as a cooperative venture between Swatch and Mercedes: Swatch Mercedes ART. The Fortwo nameplate derives from its two-person seating capacity. Until 2004, the Fortwo had been marketed as the smart City-Coupé. The developments started before 1993 originally as Swatch car of Nicolas Hayek in co-operation with Volkswagen. The idea was to design a modern microcar with an electric or hybrid drive. VW, however, could not decide on whether to produce the car or not, which led to disputes with Hayek. Hayek then turned to Mercedes. The company MCC (Micro Compact Car AG) was founded in 1994 by Hayek in Biel as a joint subsidiary of Daimler-Benz and SMH SA (Société Suisse de Microélectronique et d'Horlogerie). When MCC abandoned the original concept and the planned electric or hybrid drive, both Hayek and senior development team members left the project. "Today's gasoline-powered Smart is a product from Daimler-Benz and has not much in common with the plans of the former Swatch team." The Fortwo is noted for its 2.5-metre (8.2 ft) – 2.69-metre (8.8 ft) overall length, high H-point seating, offset passenger and driver seats (in the first and second generation, the passenger seat is 15 centimetres further rearward than the driver's), automated manual transmission (1st and 2nd generation), De Dion tube rear suspension, low CO2 emissions (119 grams per kilometre, North America, 1.0 Liter), two-part rear hatch, interchangeable plastic body panels and prominent steel hemispherical safety-cell, which is marketed as the Tridion cell and is often provided in a contrasting color to the vehicle's body panels. Fortwo models are manufactured at Smartville—a dedicated Daimler assembly plant in Hambach, France—in Coupé (i.e., hatchback) and Cabrio (i.e., convertible) body styles, each in a mono-box configuration. Generations are internally designated as the W450 build series, introduced at the 1998 Paris Motor Show, and the W451 build series, introduced at the 2006 Bologna Motor Show. Smartville underwent a 200 million euro upgrade beginning in mid-2013 for the third generation Fortwo (2014–), internally designated as the C453 build series. The third generation Fortwo made its formal global debut on July 16, 2014 at the Tempodrom in Berlin along with a closely related four-door version, the Smart Forfour, co-developed and sharing the same platform and engines with the third generation Renault Twingo. With the second generation, Smart introduced a version with automatic start-stop, marketed as the MHD, or Micro-Hybrid Drive—offered only in certain markets. A sport model, marketed as the Brabus model, has been available in both generations, and Daimler introduced the Smart electric drive, an all-electric version, in 2007. The Fortwo forms the basis for Daimler's Car2go fleet, the largest car-sharing enterprise worldwide. In 2002, the New York Museum of Modern Art (MoMa) introduced a first generation Fortwo into its permanent collection (the only vehicle to be included into the collection while still in series production), and in 2014 the Fortwo was voted the Best Microcar for the fifth year in a row by readers of the Chinese edition of Auto, Motor und Sport. At the time of its commercial launch, the Smart Fortwo diesel-engined variant, the Cdi, had the world's lowest carbon dioxide emissions for an internal combustion engine, at 88 grams per kilometer rated NEDC cycle. The 2001 marketing brochure for the W450 build series cites 0.37 drag coefficient. Auto, Motor und Sport cites a drag coefficient (Cd) of 0.35 and Alles Auto cites a Cd of 0.345 for the second generation W451 series For comparison, the current Fiat 500 offers 0.38 Cd and the first generation Honda Insight offers a Cd of 0.29. The W450 and W451 series each have a frontal area of 1.95 square metres (21.0 sq ft) and 2.057 square metres (22.14 sq ft) respectively. The first and second generation Fortwo models employ an automated manual transmission, designed and manufactured by Getrag, where the clutch is computer controlled, eliminating the clutch pedal. The first generation used a six-speed version, and the second generation uses a five-speed version, model 5AMT130. Input from floor-mounted shifter or optional steering-wheel-mounted paddles controls a servo-operated clutch and sequential automated gearbox. The vehicle may be driven in automatic mode (early models had the option of full automatic mode, or standard "soft-tip" which was manual mode indicated by no button on the gear lever) or via paddle shifters, where the operator controls the shift points but cannot feather or adjust the speed of the clutch. From 2009, revised transmission software enabled smoother and faster gear changes. The software, available via an ECU upgrade, was also made available for 2008 second generation cars, with a new battery as required. Third generation models receive a five-speed manual transmission or dual clutch automated manual transmission. With an overall length (first generation: 2.5 m (98.4 in)) approximately equal to the width of regular parking space, a smart Fortwo can park perpendicularly in spaces typically designed for parallel parking, allowing two Smarts to park in one space—a manner of parking not permissible in many jurisdictions worldwide (e.g. Austria, New Zealand and California). The first generation, build series W450, debuted in 1998 and received a facelift in 2002. The engines are turbocharged with three cylinders. Originally the basic petrol engine was 599 cc, and came in three versions—45 hp (33 kW), 51 hp (38 kW) and 61 hp (45 kW). The engine displacement was increased to 698 cc with the facelift in 2002, in 37 kW (50 hp) and 45 kW (61 hp) variants. The turbo-diesel engine had 799 cc displacement giving 30 kW (41 hp). The Fortwo is available as a coupe or cabriolet, originally called the "city coupe" & "city cabrio", now the "Fortwo" & "Fortwo cabrio", introduced in 2000 and restyled in 2002. Trim levels include the Pure, Pulse, and Passion. Pure models are fitted with the standard audio system but nothing else; Pulse models are fitted with alloy wheels, panoramic glass roof and paddle-shifters on the steering wheel (2004+); and finally, the Passion models are fitted with air-conditioning and ability to select between fully automatic and sequential gearbox. Limited 1: The first limited edition of which 7500 were made, all left-hand drive. It was released at the original launch in 1998. It had a black Tridion cell and white body panels. It also had alloy wheels, a Limited 1 insignia, and a blue interior with beige leather finishings. It was supplied with a certificate showing which number out of the 7500, and a plaque with this number below the windshield on the inside. SE: This was the second limited edition that smart made; it was sold in mid 2001 (Mk5) and all were left hand drive. They were all Pulse specification with a redesigned steering wheel, soft touch, air conditioning, CD Multichanger and drinks holder as standard. The engine power was upped to 61BHP from the standard 55BHP normally applied to the Pulse in the 600cc G1 cars. It was designated by a SE badge on the boot and was sold in Bay Grey with grey interior and dark blue twist fabric. Cdi: has the world's smallest production common-rail direct injection diesel engine. With a consumption of 3.3 litres (NEDC) per 100 kilometres (71.2 mpg) and CO2 emissions of just 88 grams per kilometre, it has the lowest current production car CO2 emissions worldwide, since Audi and Volkswagen retired its 3-cylinder cars, the A2 1.2 TDI and the Lupo 1.2 TDI respectively. Crossblade: a 2002 limited-edition variant of the city cabrio, a roadster without a windshield, roof or conventional doors. Its weight was still 740 kilograms (1,630 lb). The Brabus-tuned engine developed 52 kW (71 PS) from its 599 cc engine. After Robbie Williams purchased Crossblade number 008, Smart began a marketing association with him, using him to promote the brand and the new Forfour. Crosstown: a convertible with a foldable windshield based on the Fortwo, was presented at IAA Frankfurt in 2005. No plans have been announced to bring this model to market. Nightrun: includes instrument panels, steering wheel, paddles, shifter, Monoblock VI alloy wheels, leather seats and engine upgrade from Brabus. Edition Nightrun is only available with the Fortwo coupé/cabrio. Truestyle: painted in metallic ruby red, available in pure trim. i-move: a special edition run of 70 Fortwo cabrios, based on the Passion cabrio specs with Brabus Monobloc VI wheels, leather interior trim, Lite White panels, an iPod cradle with special edition 20Gb 3G iPod, and an aluminium name plate on the dash confirmed its special edition status. Forfun2 Concept: an off-road version of the Fortwo introduced at the 2005 Athens Motor Show by Greek 4x4 Rally Champion Stefan Attart. It combines the body of a Fortwo with the chassis and drivetrain of a Unimog. It sports monster truck-like 26-inch (66 cm) wheels wrapped in 1.4-metre (4.6 ft) diameter tires and winding keys where the Fortwo's rear wheels are supposed to be. Brabus: In 2003 Smart and Brabus introduced the jointly developed version of the Fortwo with the 698cc engine. It had 75 PS (55 kW; 74 hp) of power and 110 Nm of torque. It was available in both coupe and convertible versions. It also featured wider wheels, revised front spoiler and grille, and a revised rear exhaust. K: launched in October 2001, exclusively for the Japanese market. It was designed to fit the Japanese kei car regulations by adopting specially developed rear fenders and narrowing the track width and tire dimensions and the width reduced to 1.47 m. The engine displacement remains unchanged at 598 cc, as specified in the standard. Safety features include ESP (Electronic Stability Program) and BAS (Brake Assist System) as standard. The Smart K also facilitates the starting procedure with the Hill Start Assist that makes a starts on slopes easier. The Smart K was discontinued in November 2004. Fortwo Edition Limited One: Featured special metallic grey body panels; silver Tridion cell; brown leather for the seating, steering wheel, and shift lever—along with matching floor mats. The model marked the launch of the W451 build series. The second generation, build series W451 (internally: C 451, Coupé – A 451, Cabrio), was introduced in November 2006—its length increased by 200 mm to 2,690 mm (106.1 in) and offering improved crash performance. The second generation retained the interchangeable plastic body panels as well as the prominent exposed, rigid steel safety cell, which is 50% high-strength steel, hot-dip galvanised and powder-coated—and marketed as Tridion. The range received a minor interior facelift for model year 2011 with standard knee airbags, new instrument cluster, more extensive cloth trimming for the top of the instrument panel, circular rather than rectangular outboard dash vents, optional multimedia system with a 6.5" display, and optional surround-sound audio system. For model year 2013 all Fortwo's received a minor exterior facelift with revised lower facias, front and rear, and a relocated brand emblem located inside rather than above the front grille. The second generation Fortwo remained the lightest production car on sale in Europe. The 999 cc I3 Mitsubishi 3B2 engine (2007 onwards) is offered in normally aspirated and turbo versions. German tuner company Brabus, in a joint venture with Smart, has developed a high powered version of the 1.0-litre turbo, producing 102 PS (75 kW; 101 bhp), originally available only in Europe, but now available elsewhere. A small 0.8-litre three-cylinder turbo diesel common rail engine made by Mercedes was available in most European markets. European Union (EU) fuel consumption testing for the combined cycle rates the 1.0-litre mhd at 65.7 mpg‑imp (4.30 L/100 km; 54.7 mpg‑US), the turbo at 57.6 mpg‑imp (4.90 L/100 km; 48.0 mpg‑US) and 85.6 mpg‑imp (3.30 L/100 km; 71.3 mpg‑US) for the diesel. The U.S. Environmental Protection Agency (EPA) rates the 1.0-litre mhd at 36 mpg‑US (6.5 L/100 km; 43 mpg‑imp) combined (the EPA does not offer a rating for the diesel engine). At the 2007 Frankfurt Motor Show, Smart debuted the "micro hybrid drive" (mhd) version of the Fortwo, which was subsequently launched in the UK in 2008. The technology features an automated start-stop system, and a belt-driven starter-generator, which replaces both the starter and alternator. The system generates electricity to charge the battery when the driver is braking, and automatically cuts the engine when the speed drops below 5 mph (8 km/h). Smart claims a fuel efficiency improvement of eight percent from 50 miles per US gallon (4.7 L/100 km; 60 mpg‑imp) to almost 55 miles per US gallon (4.3 L/100 km; 66 mpg‑imp) on the slow NEDC drive cycle—with a reduction in Carbon dioxide emissions from 112 to 103 g/km. This was further improved to 97 g/km in 2010. The mhd version of the Fortwo is not available in the United States or Canada. At introduction, the second generation featured front airbags as well as seat-mounted combination head/thorax side airbags along with the tridion cell, seat belt tensioners, anti-lock brakes, brake force distribution and electronic stability control. In the United States from model year 2012 onward, the Fortwo featured a total of eight dual-stage airbags in the Coupe—front, knee, side (thorax/pelvis) and window curtain—and a total of six dual-stage airbags in the Cabrio model—front, knee, side (thorax/head) dual-stage airbags. As a part of the vehicle's tridion cell and crash management system, the front crumple zone is maximized by the rear-mounted engine location. In Insurance Institute for Highway Safety (IIHS) tests, the 2008 Smart Fortwo earned the top overall rating of "Good" in both the front and side crash tests. The Fortwo received the "Good" score in 8 of 11 measured injury categories. Its seat/head restraints earned the second highest rating of "Acceptable" for protection against whiplash in rear impacts. The IIHS did an offset crash test with a Smart Fortwo and Mercedes-Benz C-Class, which is 40% of one car's driver's side head on with 40% of another car's driver's side, and the Smart received a "Poor" rating due to the occupants' heads slamming into the steering wheel. Also, there was too much intrusion into the footwell of the Smart Fortwo. The dummy movement was not well controlled. The Smart Fortwo spun 450 degrees in the air upon impact. *The driver door unlatched and opened during the side impact crash which increases the likelihood of occupant ejection. An all-electric version of the Fortwo, the Smart Fortwo electric drive, began development in 2006. Field testing began in London with 100 units in 2007, and the second generation, with a total of 2,000 units, was introduced in 2009 and available in 18 markets around the world for leasing or through the Car2Go carsharing service in San Diego and Amsterdam. Production of the second-generation Smart Fortwo electric drive began in November 2009 in Hambach, France. The Smart EDs have a lithium-ion battery provided by Tesla Motors with capacity of 14 kilowatt-hours (50 MJ). The range of a fully charged battery is up to 135 kilometres (84 miles) under the New European Driving Cycle (NEDC) cycle. The U.S. Environmental Protection Agency's official all-electric range is 63 miles (101 km) and rated the Smart ED with a combined fuel economy of 87 miles per gallon gasoline equivalent (mpg-e) (2.7 L gasoline equivalent/100 km; 104 mpg-imp gasoline equivalent). The third-generation Smart electric drive was scheduled to be launched in the U.S. and Europe by the second quarter of 2013 and Daimler AG plans to mass-produce the electric car with availability in 30 markets worldwide. The third-generation Smart electric drive was unveiled at the September 2011 Frankfurt Motor Show. Key differences with the second-generation model include a more powerful electric motor, which improves acceleration and top speed, a new lithium-ion battery pack that will allow to increase the range to 140 kilometres (87 mi), and an option for quick-charge will be available. Brabus (styled BRABUS) is a sport package that include a sport exhaust with dual center tips, sport suspension, 16- front and 17-inch rear wheels, power steering and various Brabus visual cues. An originally planned turbocharged engine was not included. The Brabus package is available in cabriolet or coupe body styles, the latter equipped with a panoramic roof (made of glass for the first generation and polycarbonate for the second), and available in metallic silver or deep black. Designed under the direction of Kai Sieber with designer Michael Gebhardt, the third generation made its worldwide debut on July 16, 2014, having been jointly developed with Renault. The third generation is available as the 3-door 2-seater (internally designated as the C453 build series) and 5-door 4-seater (internally designated the W453 build series), marketed as the Fortwo and Forfour, respectively. Motor Trend reported prior to its introduction that the third generation was to share approximately 70% of its parts with the third generation Renault Twingo. The third generation Fortwo is powered by either of two 3-cylinder engines; a 1.0-litre engine producing 71 bhp, and 67 lb ft of torque and a turbocharged 0.9-litre (898 cc) 89 bhp engine with 100 lb ft of torque. A lower-powered 59 bhp engine will follow later. All versions come with either a manual five-speed gearbox or ‘twinamic’ automatic dual clutch transmission instead of the previous 'Softouch' system. During development, Daimler had consulted with Ford to learn about their Ecoboost 1.0-litre turbo-charged inline 3-cylinder engine, in turn sharing information about its own Euro6 stratified lean-burn gasoline engines. Prior to its debut, Smart CEO Annette Winkler reported the C453 would share its 2.69 metre length with the current W451 build series as well as its trademark hemispherical steel safety cell, marketed as the Tridion cell. The Fortwo continues to be assembled at Smartville, and the Forfour is manufactured alongside the Renault Twingo 3 in Novo Mesto, Slovenia. Smartville, where the W450 and W451 build series have been manufactured, underwent a 200 million euro upgrade beginning in mid-2013, in preparation for the C453 Fortwo. In 2015, Smart announced a cabriolet version of the Smart Fortwo at the 2015 Frankfurt Motor Show. The smart fortwo cabrio launched globally in 2016. Cabrio models received additional safety cell reinforcements to compensate for the roof openings, including torsional bulkheads beneath the car, a crossbar behind the passenger seats (sometimes referred to as a basket handle), and additional reinforcement of the A-pillars. Smart claims the standard power soft top will open or close in 12 seconds, and can be operated at any speed. At market launch, 5 soft top colors were offered; black, red, grey, beige and brown. Grey, beige and brown tops were marketed as BRABUS tailor made soft tops. The smart fortwo cabrio features removable roof bars that stow into an integrated storage space in the fortwo's rear tailgate. When removed, these roof bars allow for a fully open-air driving experience. The fortwo's roof bars are not integrated into the safety structure of the car, and only house the guide rails for the soft top to close. smart announced in March 2018 that electric versions of the smart fortwo would be rebranded as the smart EQ fortwo. This change was to further align with the upcoming Mercedes–EQ brand in which all Mercedes-Benz produced electric vehicles would receive EQ branding. The rebranding occurred for global March 2018 production, or Model Year 2018.5 in the United States & Canada. Both the coupe and cabrio electric drive models lost the electric drive badges front and rear and received smart EQ fortwo badges in their place, and received updated graphics in the optional smart Media-System. The smart was initially available only in left-hand-drive form, as the floorpan allowed only for a left-hand-drive version. Smart subsequently designed a floorpan for right-hand-drive models. The Fortwo is now marketed in 37 countries worldwide. Australia: The Smart Fortwo was marketed through select Mercedes-Benz dealers in Australia from 2003 to 2015 in only the middle 'Pulse' range, and with the petrol engine. In 2007, the base price for the Fortwo coupé was A$19,900, and the Fortwo cabriolet was $22,900. Mercedes-Benz stopped selling the Smart brand in Australia in 2015 due to declining sales. The smart fortwo was officially marketed through select Mercedes-Benz dealers in Brazil only from 2009 to 2015 (exclusively in its second generation), only with petrol engines. It was offered with the "micro-hybrid drive" natural aspirated engine (mhd) in standard configuration with a special edition named "Brazilian Edition" which was offered only in yellow (in reference to the Brazilian Flag) with a Brazilian flag sticker on both sides, and turbocharged versions named "standard" (no name), Tritop and Passion. The mhd were offered only in "coupé" configuration with no sunroof, and turbocharged versions were offered in both coupé (with sunroof) and cabrio variants. A few units of the fortwo Brabus were also offered in Brazil in the year 2010. In 2016, Mercedes-Benz decided to discontinue offer of the fortwo in Brazilian market, hence Brazilian customers never had the option of the 453. There are also a few W450s in Brazil, although they weren't officially imported by Mercedes-Benz and have no official support. 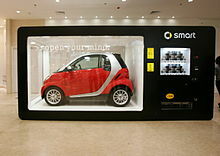 China: In April 2008, Smart premiered at the 2008 Beijing Auto Show. In October 2008, the Smart "vending machine" road show had the first stop in Shenyang and began the Fortwo's pre-order period. Japan: The Fortwo is the only non-Japanese car ever to fulfil the regulations for Kei cars. 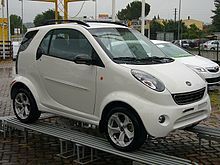 There is a Japan-only variant of the first generation Smart Fortwo, called the Smart K.
The smart fortwo was introduced in Canada in September 2004 and sold through Mercedes-Benz dealers. Only the turbo-diesel powerplant was offered for the 450 coupé and 450 convertible models because the fuel vapour recovery system for the gasoline-powered car would have had to be redesigned to meet Transport Canada standards. Diesels do not require such a system because the fuel is not volatile, so the cdi was certified instead. Demand was initially heavy, with up to six-month waiting lists in major urban areas in the spring of 2005. 10,242 cdi cars were imported in model years 2005 and 2006. Two or three of these were used in Transport Canada crash testing. Canada received three special versions of the 450 cdi: the grandstyle—only available in dark green with silver, and beige leather—of which 200 were imported in coupé and cabriolet forms, the BRABUS nightrun—equipped with BRABUS accessories at the Hambach factory, which only came as a black on black (with blue-grey leather) coupé, and 50 of those were delivered, and finally the BRABUS Tailor Made Canada 1 models, of which only four were produced, three red on red and one white on white, all with highest equipment levels and all BRABUS accessories, high-quality dyed-through leather and Alcantara interiors. The white car is a cabriolet, as are two of the red ones. The sole Canada 1 coupé has a fixed glass roof. In 2008, Canada received only the gasoline 451 model because the diesel version did not meet 2007 Canadian emission standards. The 451 fortwo carries a 1.0-litre engine that delivers up to 70 horsepower (52 kW) and a re-engineered automated-manual 5-speed transmission with a slightly larger body. This engine has been the sole powertrain for Canada since the 451 was introduced—even the BRABUS models only have 70 HP. The 451 has sold very well in Canada: over 12,600 were registered between the start of 2008 and the end of 2012. The lack of a diesel option has hindered 451 sales to some owners of the diesel 450s. Canada received several special versions of the 451 as well: the limited 1, the limited 3, the highstyle, the greystyle, the edit10n BRABUS Tailor Made (ten coupés), one all orange "Ultimate" BRABUS Tailor Made, the sharpred, among others. Smart Canada released ten 10th anniversary edition smart Fortwo cars in February 2009. Each car started life as a Canadian BRABUS model before being converted into 10th anniversary editions by BRABUS in Germany. All examples feature arctic grey metallic paint with brown and alcantara leather interiors and black BRABUS Monoblock 7 wheels. The cars carry a number plate on the dash to signify its production number out of ten. Smart Canada also commissioned Busch Automodelle GmbH to produce 1:87 scale versions (with a black tridion), of which 10,000 were made. In June 2002, a Smart Fortwo was exhibited in the U.S. at the Museum of Modern Art (MoMA) affiliate P.S. 1 in Queens, New York. In January 2005, DaimlerChrysler showed the Smart brand at the North American International Auto Show in Detroit, Michigan. Smart Forfour, Smart Roadster, Smart Fortwo Coupé and Smart Fortwo Cabrio models were shown. 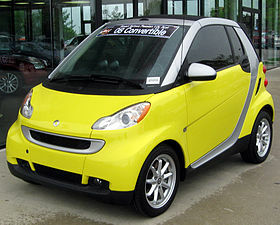 In September 2006, Daimler AG announced that Smart USA, a division of Penske Auto Group would officially distribute Smart in the United States and Puerto Rico. Subsequently, the second generation Smart Fortwo (Model 451) became available in January 2008. The 2009 model year US version of the Smart Fortwo was available in three trims: Pure (base trim), Passion, and Passion cabriolet. Pure has an MSRP of US$11,990, Passion has an MSRP of $13,990, and the Passion Cabriolet has an MSRP $16,990. A reservation program was launched by Smart USA in March 2007. This program allowed interested parties to place a $99 refundable deposit on the new Fortwo in preparation for the product's launch. After the product's launch, sales have surpassed production and the reservation program continued as a "wait list" program. The average wait used to be 12 to 18 months for delivery; although due to the economy, many buyers couldn't purchase the vehicles when they were ready for delivery and many were available on dealer lots. The Fortwo was rated as the most fuel efficient two-seater car in the United States Environmental Protection Agency's (EPA) 2008 Fuel Economy Guide, with fuel efficiency ratings of 33 mpg‑US (7.1 L/100 km; 40 mpg‑imp) city and 41 mpg‑US (5.7 L/100 km; 49 mpg‑imp) highway. The 2008 Smart Fortwo coupe was given an EPA fuel efficiency rating of 36 mpg‑US (6.5 L/100 km; 43 mpg‑imp) combined. On May 14, 2008, the Insurance Institute for Highway Safety released crash test results for the Fortwo. The IIHS gave the Fortwo top ratings in protecting passengers in front and side crashes. However, the U.S. National Highway Traffic Safety Administration (NHTSA) cited a Safety Concern on their tests of a 2008 Fortwo, stating "during the side impact test, the driver door unlatched and opened. A door opening during a side impact crash increases the likelihood of occupant ejection." For model years 2012 and later, the U.S. Fortwo Coupe featured eight airbags (front, knee, side and window curtain), while the Cabrio model featured six airbags (front, knee and side-mounted combination head/thorax). In early 2006, prior to formal importation to the United States, a specialty firm—G and K Auto conversions of Santa Ana California received DOT, NHTSA, and EPA approval to market a modified European specification Smart Fortwo in the US. Modifications for the grey market vehicles included DOT certified headlights, front and rear side marker lights, reinforced doors for additional side impact protection, an odometer in miles rather than kilometres, and soft padding on the interior pillars and ceiling. Approximately 1,000 model year 2004, 2005, and 2006 cars were imported. In September 2015, the third generation Smart Fortwo Coupe (C453) launched in the United States for the 2016 model year. US variants are offered in four trim levels: Pure, Passion, Prime and Proxy. Significant upgrades, including power steering, eight airbags, alarm, Bluetooth capability and crosswind assist technology were made standard. The 2016 Smart Fortwo also received a new engine, the 0.9 liter 3-cylinder turbocharged unit making 89 horsepower and 100 pound-feet of torque as standard. Both a 5-speed manual transmission and a 6-speed dual-clutch automatic transmission are offered. In August 2016, the redesigned 2017 Smart Fortwo Cabrio (A453) joined the smart USA lineup, offered in three trim levels; Passion, Prime and Proxy. The Cabrio model makes use of the same gasoline engine and transmissions as the C453 Fortwo Coupe. A BRABUS Sport Package was also added for 2017 for Fortwo Coupe and Cabrio models, adding unique front and rear body styling, wheels, interior appointments and a retuned sport suspension. The 4th generation Smart Fortwo Electric Drive made its debut at the 2016 Paris Motor Show. The newest generation, built on the C453 chassis, features a new 17.6 kWh lithium-ion battery and an air-cooled electric motor which produce 81 horsepower and 118 lb.-ft. of torque. A new 7.2 kW onboard charger was added, and Smart advertised a charging time of 2.5 hours at a 240 V electrical outlet. EPA estimated range was 58 miles, and the vehicle was rated at 124 MPGe City, making it the most efficient 2 seat vehicle on sale in the USA. The 2017 Smart Fortwo electric drive is offered in both Coupe and Cabrio versions in all 50 states, and qualifies for a $7,500 federal tax incentive. In February 2017, Smart USA announced the brand would discontinue gasoline vehicle sales after the 2017 model year and focus purely on battery electric vehicles. The Smart Fortwo Electric Drive arrived as a 2017 model in the summer of 2017, and the transition to electric-only occurred for the 2018 model year. 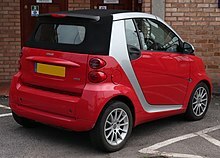 The smart fortwo was officially marketed through select Mercedes-Benz dealers in South-Africa only with petrol engines. In 2007, Chinese manufacturer Shijiazhuang Shuanghuan Automobile Co released the Shuanghuan Noble (also known as the Martin Motors Bubble), designed similarly to the Fortwo and prompting Daimler AG to sue Shuanghuan for copyright infringement. The German manufacturer persuaded the Italian court to prohibit the Noble from being exhibited at the Bologna Motor Show, but importer Martin Motors violated that injunction and put the car on display. In May 2009, a Greek judge ruled against Daimler, allowing the Noble to be sold in Greece. The judge cited that "if a vehicle varies in its technical specification, then any external similarities are irrelevant." This was in reference to the Noble being a front-engine, front-wheel-drive car, while the Fortwo is a similar sized rear-engine and rear-wheel-drive car. ^ "Celebrating 20 Years of History: smart Hambach Plant Writes Next Chapter of its Success Story". Daimler Press, via AutoChannel.com. ^ a b "New Vehicle Generation Provides Foundation for Growth 2015". Daimler.com, January 5, 2015. Archived from the original on July 3, 2015. Retrieved January 6, 2015. ^ "Smart CEO Annette Winkler: The World Needs This Car". Motor Trend, Paul Horrell, August 28, 2014. ^ a b c "Smart celebrates 1.5 million Fortwo models built, prepares to upgrade factory". Autoblog, Damon Lowney, Jul 18 2013. ^ "SMART". Acronyms.thefreedictionary.com. Retrieved 2009-03-12. ^ "So Smart". Brand Eins Online 10/2001 (in German). 2001. Archived from the original on 2012-03-07. Retrieved 2013-01-22. ^ "New Smart fortwo: design story". Carbodydesign.com, 14 November 2006. ^ "Daimler updates Smart Fortwo line, lowers CO2 emissions". Green.autoblog.com, Eric Loveday, Jul 22 2010. ^ "Geneva Motor Show 2007 – Highlights". Car Design News, March 7, 2007. Archived from the original on March 6, 2014. ^ "The Smart rehearsing the Snow Waltz (in German)". Autobild. March 17, 2014. ^ a b "World premiere for the new smart fortwo and smart forfour". Daimler. July 2014. Archived from the original on 2014-07-10. ^ "World premiere of the new smart fortwo and forfour on 16 July in Berlin". Daimler AG. ^ a b Jeffrey N. Ross (2012-10-03). "Smart Fortwo Electric Drive will be cheapest EV at $25,000*". Autoblog.com. Retrieved 2012-10-10. ^ a b c d "Third-generation smart Fortwo electric drive to launch worldwide in spring 2012; first use of battery packs from Daimler JV Deutsche Accumotive and motor from JV EM-motive". Green Car Congress. 2011-08-16. Retrieved 2012-10-10. ^ "Five for Friday (Plus One): MoMA's Car Collection". The Museum of Modern Art, April 6, 2012, Daniela Stigh. ^ "Oddly, The smart fortwo is Best Car of 2014 in China". Autoevolution, Alex Oagana, 7 March 2014. ^ "Happy tenth birthday to the smart fortwo". Gizmag, Jack Martin, September 4, 2008. ^ "Leichtbau ist nicht das Wichtigste". Auto, Motor und Sport. Da der Smart aufgrund seiner großen Frontfläche von 2,06 m2 einen hohen cW-Wert von 0,35 hat, verbraucht er im Vergleich zum niedrigen Gewicht vergleichsweise viel. ^ "Smart fortwo mhd passion". Alles Auto. Archived from the original on 2014-03-18. Luftwiderstandsbeiwert cw 0,345, Stirnfläche A 2,06 m2, Luftwiderstandsindex A x cw 0,71. ^ 'qwcdirect' (13 July 2010). "SMART FOURTWO". Archived from the original on December 28, 2010. Retrieved 10 September 2010. ^ 'tampasmart' (4 November 2009). "Do you need smart 2.0 upgrade?". Smart Car of America Forums. Retrieved 10 September 2010. ^ "Section 22502 – Curb Parking". California Vehicle Code. California DMV. Retrieved 16 August 2011. ^ a b Abuelsamid, Sam (2007-09-11). "Frankfurt 2007: Smart Fortwo micro hybrid launched". AutoblogGreen. Retrieved 2010-10-17. ^ "Smart forfun2: The combination of two vehicles with cult status". Seriouswheels.com. Retrieved 2010-10-17. ^ "Video from Fifth Gear television program reviewing the forfun 2". YouTube. Retrieved 2010-10-17. ^ "The 37th Tokyo Motor Show". Tokyo-motorshow.com. Retrieved 2009-12-18. ^ "Geneva motor show 2012: Facelifted Smart Fortwo". Autocar. Retrieved 23 October 2013. ^ "Europe's 15 lightest cars". Green Autoblog. 25 March 2009. Retrieved 23 October 2013. ^ "smart – engines". Smart. Archived from the original on 7 October 2013. Retrieved 20 October 2013. ^ 2009 smart Fortwo coupe Archived November 11, 2016, at the Wayback Machine Environmental Protection Agency. Retrieved March 10, 2009. ^ "Smart Fortwo MHD micro-hybrid (2008) CAR review". Car. 16 July 2008. Retrieved 23 October 2013. ^ "IIHS-HLDI: Smart Fortwo". Iihs.org. Archived from the original on 2009-02-13. Retrieved 2009-05-01. ^ "New crash tests demonstrate the influence of vehicle size and weight on safety in crashes; results are relevant to fuel economy policies". Iihs.org. 2009-04-19. ^ "For safer cars | Smart Fortwo". Euro NCAP. Retrieved 2009-05-01. ^ "smart.com". smart.com. Archived from the original on 2011-04-01. Retrieved 2010-10-17. ^ "smart ed". Smart.com. Archived from the original on 2008-03-15. Retrieved 2010-10-17. ^ "smart Fortwo electric drive Debuts in the US". Green Car Congress. 2010-06-09. Retrieved 2010-06-09. ^ Michael Austin (June 2010). "2011 Smart Fortwo Electric Drive – First Drive Review". Car and Driver. Archived from the original on 2010-06-12. Retrieved 2010-06-10. ^ Sebastian Blanco (2010-06-10). "250 Smart EDs coming to U.S. this fall with $599/month leases attached". Autoblog Green. Retrieved 2010-06-10. ^ "smart goes into series production with second-generation electric drive". Daimler AG. 20 August 2009. Archived from the original on 18 September 2009. Retrieved 22 August 2009. ^ U.S. Environmental Protection Agency and U.S. Department of Energy. "2011 smart Fortwo electric drive cabriolet". Fueleconomy.gov. Retrieved 2011-04-19. Select Model Year 2011 and Electric Vehicles, then click on any of the two trims for Smart Fortwo electric drive. ^ Karla Sanchez (2012-10-04). "Smarter Car: 2013 Smart Fortwo Electric Drive Starts at $25,750 – Photos Galore". Motor Trend. Retrieved 2012-10-10. ^ a b Eric Loveday (2011-08-16). "2012 Smart Fortwo Electric Drive hits 75 mph, whizzes to 60 in 13 seconds". AutoblogGreen. Retrieved 2011-08-17. ^ Korzeniewski, Jeremy (2008-10-23). "smart Fortwo BRABUS coming to America". Autoblog.com. Retrieved 2010-10-17. ^ "2015 Smart Fortwo revealed". What Car?. 16 July 2014. Archived from the original on 28 September 2014. Retrieved 29 August 2014. ^ "Daimler consults Ford on turbo three-cylinder engine development". Nick Gibbs, Automotive News, 5/24/2013. ^ "Renault Twingo to share majority of parts with Smart Fortwo". Left Lane News, Justin King, Mar 18, 2014. ^ "Das ist keine Geheimniskrämerei (in German)". Manager Magazine Online, Wilfried Eckl-Dorna, Nov 18, 2013. ^ Hilton Holloway. "New Renault Twingo spotted". autocar.co.uk. ^ "2017 Smart Fortwo Cabriolet U.S. Spec". 2016-09-30. Archived from the original on 2016-11-28. Retrieved 2016-09-30. ^ "Smart Had to Redo Tridion Safety Cell for Cabrio Version". ^ "Smart Electric Drive gets 'EQ' rebrand". ^ "Smart car brand axed in Australia". 2015-03-05. Retrieved 2017-07-29. ^ "Greg Williams – Motor Writer — Automobiles, Trucks, Motorcycles old and new". Archived from the original on 2016-03-04. Retrieved 2015-04-07. ^ "2005 Smart Roadster, ForTwo, ForFour, ForMore – 2005 NAIAS Detroit Auto Show Coverage". 2004-12-23. Archived from the original on 2016-10-03. Retrieved 2016-09-30. ^ BLOOMFIELD HILLS, MI (April 2, 2007) – Smart USA, a subsidiary of United Auto Group, Inc, (NYSE:UAG), has launched its Smart Fortwo reservation system. The Smart Fortwo is expected to go on sale in the United States in the first quarter 2008 through a dealership network being developed by Smart USA, the exclusive distributor of the Smart Fortwo in the United States and Puerto Rico. ^ "2009 Smart Fortwo". Automotive.com. Retrieved 2010-10-17. ^ "SmartUSA website". Smartusa.com. Retrieved 2010-10-17. ^ "Reserve your Smart Fortwo for $99". Egmcartech.com. 2007-02-05. Retrieved 2010-10-17. ^ "How smart is the Smart car?". Kare11.com. Archived from the original on 2013-01-08. Retrieved 2010-10-17. ^ "Smart Fortwo Car Rolls Into KC". Kmbc.com. 2008-01-22. Archived from the original on 2011-07-19. Retrieved 2010-10-17. ^ "Model year 2008 Fuel Economy Guide" (PDF). U.S. Department of Energy. Retrieved 2013-02-27. ^ "Model 1 Vehicle Characteristics". Fueleconomy.gov. 2006-09-10. Archived from the original on 2011-06-14. Retrieved 2010-10-17. ^ "IIHS news release". Iihs.org. 2008-05-14. Retrieved 2010-10-17. ^ "NHTSA Website". Safercar.gov. Retrieved 2010-10-17. ^ "2017 Smart ForTwo Cabrio First Review | Kelley Blue Book". Archived from the original on 2016-11-13. Retrieved 2016-09-30. ^ "New BRABUS Sport Package now available on smart fortwo coupe and cabrio". Archived from the original on 2016-10-03. Retrieved 2016-09-30. ^ "2017 Smart ForTwo Electric Drive Preview". Cars.com. ^ "2017 smart fortwo electric drive coupe". ^ "2017 smart fortwo Electric Drive: First Drive Review – Autotrader". Autotrader. ^ "Daimler to focus Smart brand on electric cars in U.S., Canada". Reuters. 14 February 2017 – via Reuters. ^ smartusa. "mini electric cars and micro urban cars – smart USA". smartUSA.com. ^ "Smart ForTwo EV 10th Anniversary Edition Launched | Kelley Blue Book". ^ Jonathon Ramsey (2009-01-06). "Mercedes Tries to Burst Shuanghuan's Tiny Bubble, Gives Up". Autoblog.com. Retrieved 2012-01-14. ^ Blanco, Sebastian (2007-12-11). "Good Idea? Smart Clone Importers Violate Court Injunction at Bologna Motor Show". Green.autoblog.com. Retrieved 2012-01-14. ^ "Greek Court Rules Against Daimler on China SUV". Autonews.gasgoo.com. 2011-10-10. Retrieved 2012-01-14.